It’s funny to think that out of all of the releases coming out this year (including a console Final Fantasy game), Bravely Default was my most anticipated. Even more surprising is the fact that this is a spiritual successor to Final Fantasy: The 4 Heroes of Light, a title that was a decent, if not underwhelming, take on the FF series’ roots. 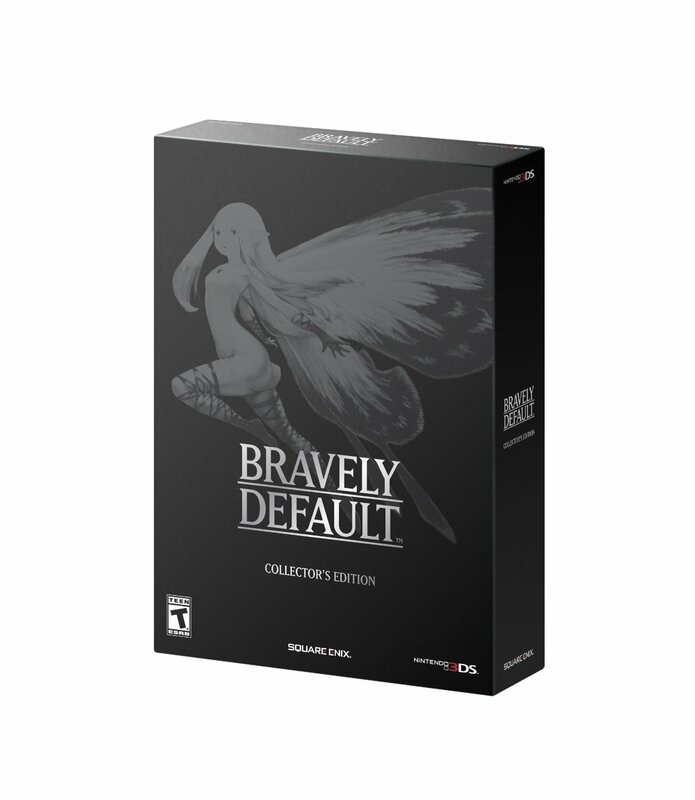 And let’s not forget the game’s Japanese title, Bravely Default: Flying Fairy, considered unusual even in the company of other Square Enix games (Dream Drop Distance anyone?) Between those things and a demo that failed to spark my excitement, there’s no reason I should have been as excited for the game as I was. And yet, here I am ready to shout its name from the rooftops. It’s a wonder that the game saw localization at all given its original Japanese release landed in 2012. 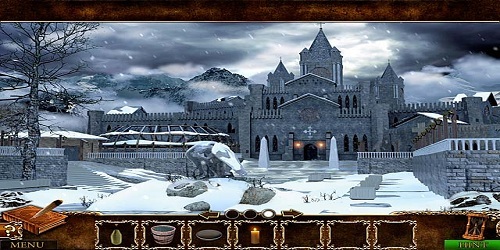 It did receive an updated version known as For the Sequel that enhanced the experience further, which is the one the international release is based upon. Square Enix themselves clearly didn’t see the potential, which is why you’ll notice Nintendo is credited as the publisher. Which is strange, as I don’t think I’ve ever seen a traditional RPG marketed as heavily as this one in quite a long time. I even saw TV commercials for this game! Now that the game is in my hands, I can tell you that despite the hype and the marketing push, Bravely Default really does live up to its reputation. Even better, it’s more than just nostalgic posturing. 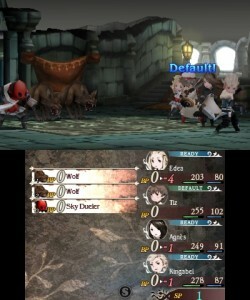 You learn very early on in the game that Bravely Default is quite clearly a Final Fantasy game in everything but name. You assemble a party of four and go on a journey in search of the four crystals, a premise that should be very familiar to pre-PlayStation era fans. In fact, I would even go so far as to say the game functions as a re-imagining of FFV if that game were to have been created today with modern technology. 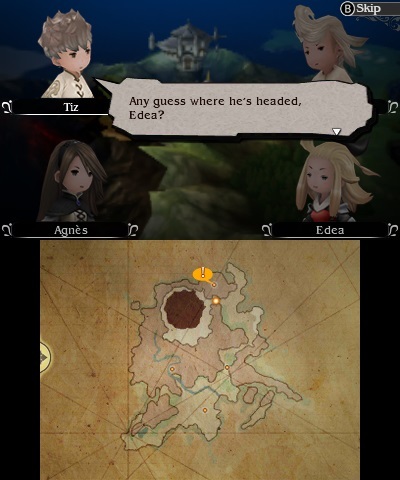 The key difference being that instead of the plot being a mere vehicle for moving the game forward, it’s actually one of the strongest aspects of Bravely Default. What makes that revelation so surprising is that it’s so deceptively simple on the surface. Each of the four main characters have a chance meeting very early on. They also carry with them some common JRPG cliches. Tiz is a simple farm boy whose village and family are swallowed up by a great chasm. Agnes, accompanied by her annoying fairy companion, Airy, is this universe’s version of a nun and is naïve to the outside world as a result. Then you have Ringabel, a womanizing amnesiac because of course he is. Rounding out the cast is Edea, a headstrong (and also naïve) knight with daddy issues. There was a point very early on where I contemplated just skipping all of the cutscenes and just playing with the addictive battle system. But I kept with it and the end result was very rewarding. How any writer can take such tropes and turn it into the twists and turns this game provided is nothing short of masterful. I loved it. Characters are further fleshed out in sequences called Party Chat, which is the Bravely Default equivalent to the skits in the Tales games. You’ll see the character portraits on screen and a text based exchange based on whatever might be happening at the time. Sometimes it’s relevant to the story, but often it will devolve into some humorous hijinks. Some of them are pretty good, though they can be invasive to the flow of the game, especially when they pop up just after a cutscene. At least they can be watched again later if you choose to skip them. I think the game’s visuals played a large part in why I didn’t want to take the game seriously at first. They are of the super deformed chibi variety, much like the recent FFIII & IV remakes, and are very lacking in the way of details. I mean, they don’t even have noses for crying out loud. Yet, when you get used to them, they are rather charming. I also enjoyed the concepts for the various job outfits each one would wear. Many of the towns and other important landmarks appeared to be hand drawn, which made them really pop, especially when the 3D was used. It had its own unique style, and it ran with it. Bravely Default comes equipped with dual audio, so Japanophiles will be happy to know that the game can be experienced in its native language. The English track had some familiar talent (such as Liam O’Brian), though there were a large number of voices that I hadn’t heard before that performed very well. In fact, it’s probably one of the stronger English casts I’ve heard in a JRPG. Outshining that though, is the outstanding soundtrack. Unlike say, a Tales game, the battle theme doesn’t change throughout the adventure, yet manages to not grow stale. The various towns and dungeons are similarly catchy, and I especially loved the ending vocal theme during the credits. Unlike the demo that drops you into fetch quest-land and doesn’t even bother to kiss you on the way out, the actual retail game is very good at getting the player acclimated to its mechanics. A set of tutorial quests explain some of the finer nuances while rewarding you with items upon successful completion. Not that the game is terribly complicated to begin with, though with each new job added to your arsenal comes a set of abilities that take some experimentation before they can comfortably be added to your repertoire. 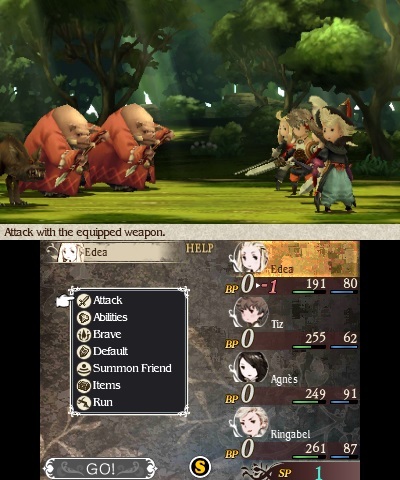 At first glance, it may seem as though Bravely Default is just another Final Fantasy/Dragon Quest clone with its random battles and turn-based combat, though the risk/reward system in place differentiates it just enough to give it its own identity. 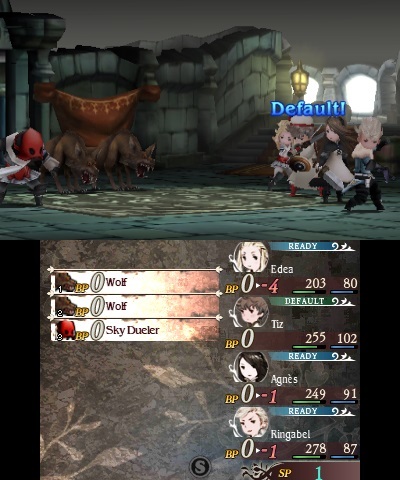 The game’s title comes from two options that can be used in battle: Brave and Default. Each turn your character expels one BP if they decide to perform an action, though they also replenish one the next time their turn comes around. If they decide to Default (which is basically the same as defending) a round, that BP will go unused and can be stored for later, up to a maximum of three. The Brave command uses an extra BP for the character to perform multiple actions at once. You can Brave up to three times a turn, thus giving your character further actions. In fact, you can do this even if you don’t have three BP stored up and will instead let it go in the hole, though the character will be left defenseless until they’re at least back at zero. So in theory, you can Brave multiple times in every random battle you get into and clean house before the enemy party even has a chance to make a move, assuming you have the strength to take them out in one turn. 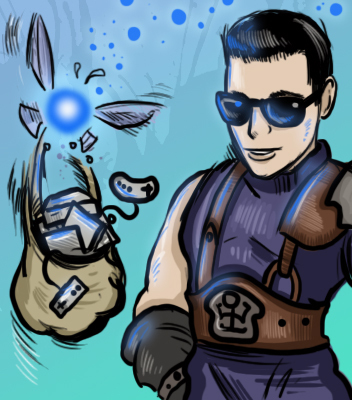 Defeating certain bosses will reward your party with Asterisks, thus opening up new jobs for them to master. Many of the job names and the spells allocated to them should be familiar to FF vets. Even rebranded ones take on the characteristics of jobs originally from that universe, such as how the Valkyrie bears a similar moveset to the Dragoon. And just as each character has a level, so too do the jobs they inherit, with each job level adding a new move or ability to their skillset. Characters can equip any weapons or armor that they want, though certain jobs grade different pieces of gear depending on how well they can use them. For example, a Monk can do major damage with fist weapons, but falters in nearly everything else. If you decide to switch jobs, you can maintain the skills of at least one other job while doing so, as well as mix and match some of the passive abilities. So if I wanted my Knight to have healing spells, it’s well within my power to do so. And it’s that very experimentation that makes the game so addicting. 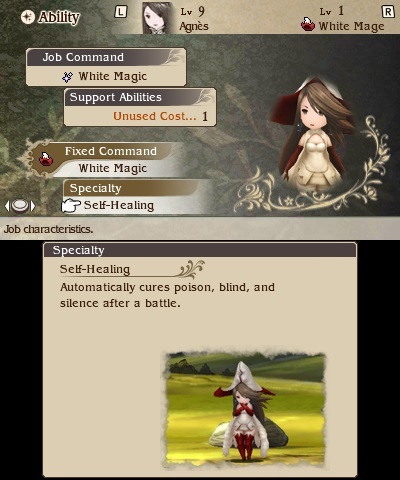 Bravely Default has a very strong social element as well. Norende, the town wiped out by the Great Chasm at the beginning, can be repaired as you go about your journey. At first, you’ll only have one villager (you) in which to rebuild. But for every Street Pass you earn, a new one will be added. Don’t have any friends with the game? You can net invite up to five strangers a day to come to your village and aid in the reconstruction. Each building can have a certain number of villagers assigned to it and by constructing and subsequently upgrading those buildings, you will unlock items and skills to utilize in the main game. The construction happens in real time, sometimes taking dozens of hours to finish. Though for every villager you have on a project, it cuts down on the time needed to complete. Occasionally, Nemeses will come to invade your village, though despite their menacing appearance, don’t do any harmful damage to your rebuilding efforts. They can be challenged by your main battle party, leading to earned items upon their defeat. They come and go if you do nothing with them, with new ones appearing each time you connect to the internet and Street Pass your friends, though you can deliberately send certain ones to people, or protect them to fight yourself. I couldn’t tell you how often I was bombarded with level ninety nine foes. That’s not the only benefit to having friends with the game. During battle, you can summon your friends to launch an attack for you, and those much farther than you can put some serious hurt on the enemy. Likewise, you can send an attack to your friends to use and you don’t lose turns in doing so, so there’s no reason not to pay it forward. A level of customization comes with this feature as well, since the special moves in the game can be outfitted with elemental affinities and status effects, though you can create your own custom attack names and quotes for your characters to say. There’s also a feature called Abilink that will tie one of your friends to a character in your party. While this is enabled, that character will have access to all of the job levels unlocked by that person’s version of the character. This includes any passive abilities, allowing you to benefit from the hard work and potential grinding of a buddy. It’s unusual to talk about social gaming without the potential of micro-transactions being present, and the same is true here. However, it’s implemented in a very non-intrusive way. 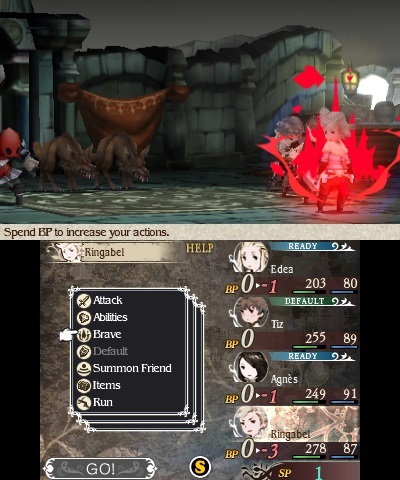 A game mechanic is introduced very early on known as Bravely Second, that uses what’s called SP to essentially stop time in the middle of a turn and allow one of your characters to take an action instantly. What this means is, if you’re on the receiving end of some harsh punishment, you can call a timeout and heal your characters that very moment. There’s two ways you can earn SP. One is by leaving your 3DS in sleep mode while the game is on at a rate of one SP for every eight hours of sleep. Or, as you might have guessed, you can pay real money for it. Having played through the entirety of the game, I can tell you that there is NEVER a time where you NEED to use this feature. So I can’t think of any good reason why someone would spend additional money on something like this, but to each their own. Despite its roots in older JRPG’s, Bravely Default has included a number of more modern features. The most obvious is an overworld map on the lower screen that pinpoints where your main quest is located as well as slowly unearths dungeons as you explore them. Any sidequests are marked in blue, which are consequently your main source of new jobs. Battles can be fast forwarded at the touch of a button, difficulty can be changed at a whim, and random battles can even be turned off entirely. While I can see many crying foul at giving players such an option, it’s incredibly useful if your main concern is exploration and not getting into fights every two steps. It’s not as though skipping them entirely is an option, as being under-leveled will lead to some seriously punishing boss fights, especially in the late game. If you were fortunate enough to get your hands on the collector’s edition for the game (check out my unboxing to see what you’re missing), it comes equipped with all of the things I find necessary in such a set. Namely, the soundtrack and the artbook. While I loved the fact that the soundtrack came with its own jewel case, I was slightly let down that the included artbook wasn’t a hardcover; the paperback ones are far more prone to wear and creases, especially with continued use. I thought the AR card were a nice touch though. With the amount of customization and the ease of entry, Bravely Default is an RPG that anyone regardless of skill level can pick up and play. It may not be a multiplayer game in the strictest sense, but it’s one that knows how to foster a community of like-minded people playing alongside one another. 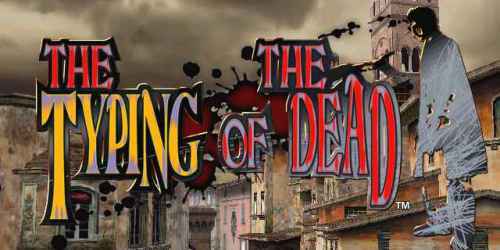 It also has some serious meat on its bones for a 3DS game, as depending on the level of participation in side content, a single playthrough can take anywhere between thirty to sixty hours. There’s also multiple endings to be discovered. It completely exceeded my expectations of it and I can’t recommend it highly enough. Bravely Default is everything Final Fantasy: The 4 Heroes of Light wanted to be. It takes the best parts of Final Fantasy V‘s job system and applies it to a modern game enveloped with an engrossing plot, particularly in the later chapters. While the game does contain some elements of social gaming and micro-transactions, they are non-invasive and the former actually plays to the game’s strengths. Meanwhile, the simple Brave/Default system that comprises the central game mechanic of the battles is effective at providing fun and strategic combat. This is one franchise I would love to have a Bravely Second helping of. So funny story on this one. As of last night I’ve logged FORTY hours on this game but I’m only at the end of Chapter 3. I read your review and was like “How the hell did he beat the game in 30?” Well…it turns out at some point my game was turned to +100% battles. Which also explains why a) my guys are level 60 and one turn killing bosses, b) why my city is 100% complete already and c) why this game felt way too much like Dragon Quest VII for me. I think I was bit closer to 40 when I got one of the endings, but if I skipped out on the side material, it would’ve been doable in 30. I’m now trying to go for the other ending and it is much tougher than I was expecting. Well at this point I’ll probably just get the Good/True ending since my guys are strong enough to probably achieve that NOW. By the time I get to level six I’ll probably be at level 99 with everyone…albeit it without grinding. Oy. You can get both endings in one playthrough. If you do the normal ending it will send you back to right before the point where you first embarked down that path.